From Angola and the Democratic Republic of the Congo to Cambodia, Afghanistan and Colombia, a large number of countries have been –and continue to be– afflicted with serious conflicts over the control of natural resources (oil, diamonds, hardwood, cocoa beans, cocaine and opium). Although some conflicts have come to an end, others are still ongoing and it is possible that many more will arise in the future if the matter is not addressed, from both within and outside of the borders of the war-afflicted countries, in an efficient manner. (From Madrid) THE ABUNDANCE OF NATURAL RESOURCES has helped fuel armed conflicts in many developing countries. The conflicts are mainly over mineral resources like oil, diamonds and other precious stones, but not exclusively: the list includes hardwood, agricultural products like cocoa beans and illegal drugs, such as cocaine and opium. From Angola and the Democratic Republic of the Congo to Cambodia, Afghanistan and Colombia, many countries have been –and continue to be– afflicted by conflicts over the control of said resources. Although in some of the most serious cases these conflicts have come to an end, others are ongoing, and it is possible that many more will arise in the future if they are not dealt with in an efficient manner. “Financing the fight for local resources often includes criminal acts like the looting of civilians and kidnappings” There are several ways in which the resources and conflicts are intertwined. In some cases, the resources contributed to the financing and prolongation of wars that had broken out due to other factors (such as ideological clashes and demands by certain regions or groups that considered themselves to be abandoned by the State). After the end of the Cold War, support from the two superpowers to their allies in the Third World decreased or disappeared altogether. As such, the opposing sides were forced to finance the wars with local resources, including criminal acts like the looting of civilians, kidnappings, unlawful appropriation of humanitarian aid, drug trafficking, and the extraction and sale of natural resources. In Angola, the two sides were financed with oil and diamonds, respectively. Paradoxically, in Mozambique, a neighboring country with a twin war that did not have resources at its disposal, the consolidation of peace was easier once foreign support ceased. Other conflicts are even more closely related with resources. Some groups claim that they are being politically excluded or denied rights in order to start a fight, although in reality they are trying to gain control of certain natural resources (often, the only possible source of income in very poorly economically developed societies). “If the objective is to control the resources, winning over the hearts and minds of people is of secondary importance” Taking control is, in these cases, secondary or nonexistent, given that the chief objective is to maintain control over those resources. An example of this type of conflict is the one that took place in Sierra Leone. The third way in which both variables are related to each other has to do with the consequences of commercial extraction of resources. Often the revenue generated from this process never leaves the hands of a small elite that wields its power and uses the resources for their own personal benefit, and not for the collective wellbeing. On the contrary, the affected populations suffer the consequences of that extraction (destruction of the environment, the impossibility of resuming traditional activities like hunting and fishing, the expropriation of land), “In Sierra Leone, diamonds triggered the conflict and kept it going for years” but are neither consulted beforehand nor given compensation for it. This can give rise to conflicts, as has occurred in Indonesia and the Niger River delta region. The exploitation of resources is one of the factors that explain why 90 percent of casualties in contemporary wars are civilians. If the objective is to control the resources, winning over the hearts and minds of people is of secondary importance. What’s more, in order to establish and maintain control over those resources it is necessary to subdue the population that lives in the region, or use terror to drive the people out. The forced conscription of child soldiers is part of this logic of terror, as well as mutilations and acts of intimidation. Diamonds played a key role in some truly brutal conflicts, such as those in Angola and Sierra Leone. In Angola, it is estimated that the National Union for the Total Independence of Angola (UNITA) made about 4 billion euros between 1992 and 1998 with the illegal sale of these precious stones. 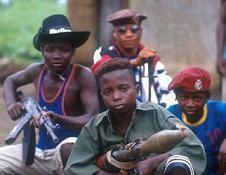 They triggered the conflict in Sierra Leone and kept it going for years. In Liberia, the Lord of War Charles Taylor (today being tried for war crimes in the Special Court for Sierra Leone) used hardwood and diamonds from Sierra Leone to finance his war, which caused 250,000 deaths. He continued to do the same after being elected president in 1997. “Oil is often associated with corruption, and it provides governments with an important source of revenue without needing the support of the population or collecting taxes” And in Cambodia, the Khmer Rouge and other armed factions funded their rebellion with revenue from the illegal sale of wood and precious stones. The war in the Democratic Republic of the Congo (RDC), and the violence that plagues the eastern part of the country to this very day, can be explained in a large part by the fight between domestic and foreign players for the control of the region’s immense wealth of mineral resources: gold, diamonds, coltan, casitterite, copper, cobalt, wood, etc. Whoever controls the militias, who in turn control the mines, makes a lot of profit from the sale of these resources, and this includes political sectors linked with the governments of the RDC itself and those of other countries such as Uganda and Rwanda. This explains why it has been difficult to move forward with demilitarization programs and disarmament and veteran reintegration. Oil is often associated with corruption, and it provides governments with an important source of revenue without needing the support of the population or an efficient system of tax collection. Often, this money –and the commissions and bribes that pay the extraction industry– also contributes to the financing of the violence. China purchases around two thirds of Sudan’s oil exports, and it has been accused of selling arms to the Sudanese government despite its responsibility in the conflict and the humanitarian crisis in Darfur. This country was considered the African miracle because of its political and economic stability, despite being surrounded by countries in conflict. But in 2002 an uprising within the armed forces escalated until into a large scale rebellion. After several failed peace agreements, “Côte d’Ivoire exports 40 percent of the world’s cocoa beans; at least 20 percent of the government’s military expenditure was financed by the cacao industry” the country was divided into a northern region controlled by the rebels and a southern region controlled by the government, separated by UN peacekeeping troops and French forces. Resources have played a key role in this conflict. The rebel forces would work the diamond mines and send the products to the international market via Guinea and Mali, and they raised funds through the cultivation of cacao and cotton. Something similar occurred in the areas controlled by the government. Côte d’Ivoire exports 40 percent of the world’s cocoa beans and the majority of the plantations are in the South. The UN estimated that at least 20 percent of the government’s military expenditure was financed by the cacao industry. “There is an obligation to protect civilians in these contexts when their own States do not want to –or cannot– do so”Cocoa beans are also at the root of the conflict. Its production was based on the availability of a cheap workforce and virgin forests, and it helped bring about the arrival of workers from foreign countries to cultivate the cacao plant. The slogan was the land belongs to whoever works it. The method worked until the virgin forest regions began to get used up, and the fall in the global price of coffee caused a significant economic crisis. At that moment, the competition for access to land –until then abundant– exacerbated ethnic and economic tensions and finally led to the war. The country is currently going through a difficult peace process but there are some positive developments. First of all, the government has decided to publish the State’s revenue from cocoa beans, as a first measure towards curbing corruption. The attorney general, in turn, has prosecuted members of state and semi state-run businesses in the sector that were diverting funds for military expenses. However, the progress being made is fragile. The international community has been more and more active when it comes to recognizing the role of resources in the outbreak, intensity and duration of the conflicts and, on occasion, has classified the phenomenon as a threat to international peace and security. “A definition of resources of the conflict that allows for the contexts to be approached in a more coherent and systematic manner has not been achieved” At the same time, the serious human rights and the International Humanitarian Law (IHL) violations that are occurring in these contexts have been one of the factors behind the development of the concept of responsibility to protect: in other words, that there is an obligation to protect civilians in these contexts when their own States do not want to –or cannot– do so. Within the framework of these conflicts a key issue is the resources’ access to international markets, and the fact that on many occasions the revenue that they generate is used to buy arms with which to continue the war. The UN has studied these situations case by case and has been imposing embargoes on diamonds, oil, arms, etc; they have had uneven results. But the greater awareness of the effects of these conflicts has also set in motion different initiatives to impede or regulate the trade of these resources, from both governmental and nongovernmental camps. Examples include the Kimberley Process Certification Scheme to regulate the trade of diamonds and the Publish What You Pay initiative, whose aim is to make the extracting businesses more open (such initiatives and their results will be addressed in a future analysis). Aside from the UN, other institutions, such as the United Nations Development Program and even the G-8, have added the wars for resources to their agenda. However, there is still much left to be done. Among other issues, a definition of resources of the conflict that allows for the contexts to be approached in a more coherent and systematic manner has not been achieved.